KIEV, Ukraine (AP) -- On paper, the Ukrainian trading firm known as Mistral dealt in management consulting and research, doing millions of dollars' worth of deals before going bust after Ukrainian President Viktor Yanukovych was chased out of office earlier this year. But when police recently tried to visit Mistral's Kiev office at No. 12 Saperne Pole Street, they found a huge hole in the ground, the foundation of an apartment complex to be completed next year. There was no trace of Mistral, whose name refers to a type of wind. A receptionist at No. 5 on that street said there used to be a wine warehouse at the site, but it was cleared when construction began in 2011. Apartment numbers now jump from 9 to 22. Officials tasked with cleaning the country's corruption-scarred tax system say the company didn't merely enter the wrong address. They say Mistral may never have existed in the first place — one of scores or even hundreds of phantom firms suspected of squeezing a total of 130 billion hryvnias ($11 billion) from Kiev's coffers over the past three years. The country's total tax revenue amounted to 210 billion hryvnias ($17.8 billion) in 2013. Some 30 investigations are now underway, and a handful of companies have been raided, but the country's top tax official contends his predecessors were part of the fraud, which is why many phantom firms acted with impunity. "They didn't care about the police, the security services. Nobody was checking," Deputy Tax Minister Ihor Bilous told The Associated Press in an interview at his Kiev office last month. "That's why this cancer ... spread over the whole country." Outside experts support Bilous' claims, and documents reviewed by the AP — including tax records, a list of alleged phantom companies drawn up by a Ukrainian anti-corruption group, and data from the business intelligence website Arachnys — echo his description of a wide-ranging scheme. Bilous' assertions are "very hard not to agree with," said Anna Derevyanko, the director of the Kiev-based European Business Association. "Basically whatever field you are touching, it was corrupt in the territory of Ukraine." Tax fraud has long been a problem here, and reforming the country's revenue system is a key challenge faced by the newly elected administration of Petro Poroshenko, who was sworn in Saturday as Ukrainian president. For now, Ukraine's budget is being held together with the help of a $17 billion IMF loan package; Bilous says he's proposing a series of changes to the country's parliament in a bid to put the country on a firmer financial footing. The success of those reforms may hinge on whether the country can exorcise its phantom firms, fake companies which have long been used by legitimate businesses to reduce their tax bills. According to officials and insiders, here's how it worked: A business pretended to buy goods or services from the phantom firm but, instead of delivering on the deal, the fake company secretly returned the money in cash, reducing the real company's tax liability in return for a cut of the money. Some 1,700 legitimate businesses were in on the scam, according to the ministry, which flushed them out by identifying 100 to 120 phantom companies and tracking who was at the other end of their deals. Getting in on the scam slashed tax bills dramatically. One home appliance importer used phantom partners to whittle its tax obligations down to $85,000 a month, according to ministry figures. Once it dropped the tactic, its payments jumped tenfold. Those behind the phantom firms stood to make huge amounts of money; one tax document reviewed by AP showed that a company purporting to be a Kiev-based trading firm drew in $190,000 in sales per month — with only a single employee on a monthly salary of just $110. A businessman with nearly two decades' experience in Ukraine estimated that $300,000 he owed in tax was instead split between his companies and the various phantom firms he dealt with over the years. In an interview, he complained that Ukrainian taxes were so high and the rules so erratically enforced that he had to work with phantoms just to stay afloat. He spoke on condition of anonymity because he feared prosecution. The corruption began at the top, said Bilous. He accused his predecessor, Yanukovych ally Oleksandr Klymenko, of organizing the previously ad hoc fraud into a nationwide system, organized "like a pyramid" with legitimate firms at the bottom funneling money through their phantom partners until it reached Klymenko and his associates, who either ran the phantom firms through proxies or took a cut of their proceeds. Klymenko denied his successor's allegations. "These are groundless accusations," he said in an interview over Skype, saying that he'd improved the tax agency by, for example, implementing a new IT system. But then there was the secret chamber. Across the atrium from Bilous' office, spokeswoman Yaryna Klyuchkovska showed off a steel, soundproof vault where she said Klymenko and his colleagues worked out how to divide the illicit cash. The vault was equipped with a white-noise generator to beat eavesdroppers and furnished with clear plastic tables and chairs so those haggling over their spoils could see there were no listening devices attached to the furniture, she said. Klymenko did not return emails about the vault, but using transparent furniture to beat surveillance "is straight out of the old-school, Eastern Bloc, counterintelligence playbook," said Vince Houghton, the historian and curator of the International Spy Museum in Washington, D.C. He said East Germany's intelligence service used to keep transparent furniture in a vault at its embassy in Rome — a sure sign of concern over eavesdropping. "If it's in a secure, soundproof vault I can't see any other reason for it to be there," he said. The system that ran from the vault kicked the corruption into overdrive, Bilous said. In 2013 alone, he said phantom firms helped intercept between $3.4 billion and $5 billion meant for the state, figures derived from an analysis of phantom firms' reported sales. Klymenko, who said those estimates were "made up," spoke to the AP from an undisclosed location, having left Ukraine in a hurry following Yanukovuch's departure. Surveillance video taken from a Ukrainian airport shows Klymenko and the country's chief prosecutor scuffling with guards who tried to detain them and overturning a metal detector gate as they try to reach their plane. Klymenko left behind a set of crocodile-skin armchairs which, together with other luxuries, carry echoes of the extravagance of the Yanukovych mansion that protesters overran in February. Klyuchkovska said the armchairs were slated for auction. Despite Bilous' actions, skeptics say the new government is not doing enough to end fraud. 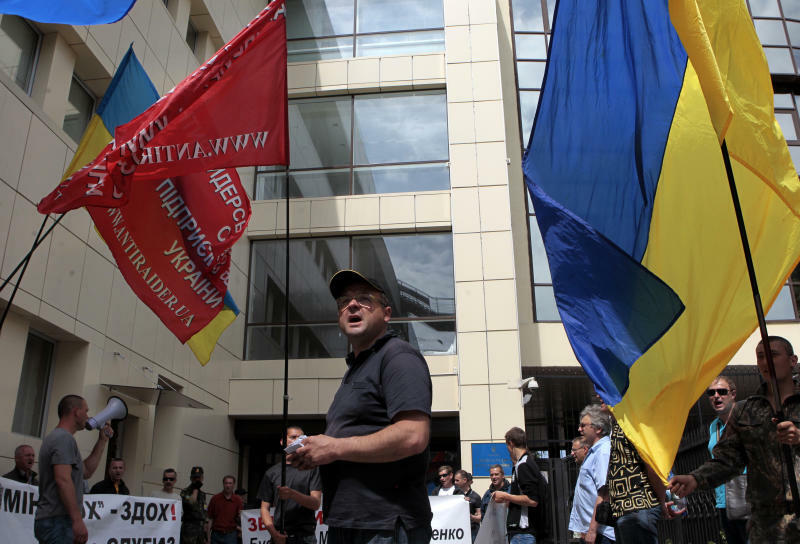 Outside the tax ministry, drum-banging, bell-clanging protesters from the Anti-Raider League of Entrepreneurs, an anti-corruption group, accused Bilous of not doing enough, alleging that crooked officials from the previous administration had merely been shuffled around. Bilous "has not changed anything," said the league's director, Andrei Semedidko. "How are we going to build a new country when the faces are the old ones?" A blacklist of phantom firms provided by the group listed 11 of them based in just one of Ukraine's 25 regions, including Crimea, which is also claimed by Russia, and he estimated the true number of phantom firms at around 1,200. In the past five weeks authorities say they have shut at least 30 phony firms across the country, often raiding empty offices filled with bogus paperwork, fake corporate letterhead, and bundles of cash. But there have been no mass firings at the tax ministry. Bilous said he was doing what he could in the face of entrenched corruption, saying tax evasion had been a problem "for the last 23 years, and it's not easy to close it down." But he acknowledged he's dealing with a crisis. "I call it a national security problem," he said, "because if we continue like this, the budget deficit will basically kill us, in a year or two years' time." Associated Press producer Theodora Tongas, photographer Sergei Chuzavkov, videographer Eldar Emric and Valeriy Kulyk contributed to this report.